Doctor Slime - Science Education | Demonstrations in the name of Science! Welcome Mad Scientists, K-12 Teachers & Home Schooling Parents! 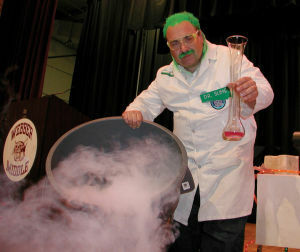 Book Doctor Slime’s Science Show for your next event! Do you like Science? Are you fascinated by things that puzzle others around you? Are Mad Scientist’s your bag? This site is dedicated to making Science FUN! Teachers as well as students of all ages are welcome. Take a look around, and be sure to email me if you have time. I also perform as Doctor Slime in many school, malls, or conventions, so if your event needs a little Science or fun injected, visit our Events page to learn more about booking me! Looking for more fun? 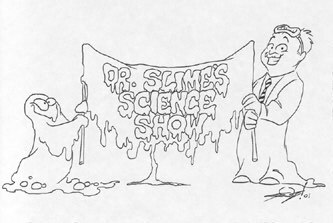 Be sure to: Download the Doctor Slime Coloring Book! Remember these Rules for Safe Chemistry! 1. Never work alone; always work with a parent or teacher. 2. Always wear proper safety equipment for the experiment you may be doing. If you’re not sure, ask. 3. Always do research (reading) before you experiment, so you understand what might happen. when and if it does. 4. Have fun with Science! It’s a blast! Summer Library shows kicked off with a Blast, this Thursday is fosters in Lansing. The last summer library show is July 22nd in Mt. Pleasant, mi. Designing new set of sound shows for 2018. Hi, I’m interested in trying to set up an assembly for K.C. Ling Elementary in Hemlock. I was unable to find your email address. Please contact me. Shows booked for the week of March 5=8th my spring break are offered a 100 dollar discount, a std 450 show will cost only 350 this week only, as I don’t have to take time off, to handle your show, we both save this week. Just finished 3 shows Feb 2nd, in Midland & Bay city. Call now, to book you show, good dates are going fast.